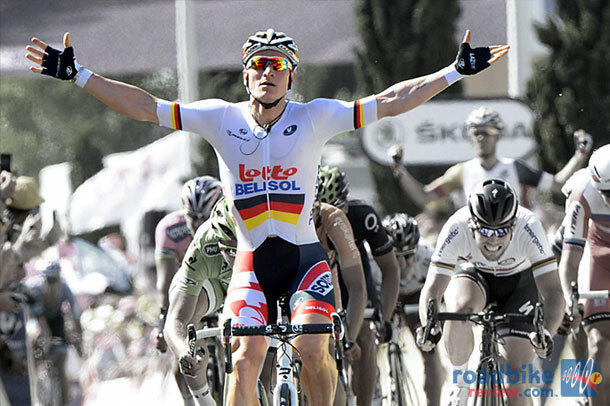 The Ridley Noah FAST propels André Greipel to the stage 6 win. A custom “gorilla” paint job, oversized 35mm bars and stem, and a massive 54-tooth chainring. This bike could belong to only one rider, burly German sprinter André Greipel. Indeed, the recently crowned German national champ — and winner of stage 6 at this year’s Tour de France — is pedaling toward Paris aboard a 56cm Ridley Noah FAST. Highlights of this aero road bike include front and rear brakes that are completely integrated with the frame for a super clean look, full internal cable routing, and an 80th anniversary edition 11-speed Campagnolo Super Record drivetrain. Gearing is the aforementioned 54-39 chainring paired with an 11-25 rear cassette. An integrated seatpost is topped by a San March Regale Racing Team saddle. And 50mm aero profile Campagnolo Bora Ultra 2 wheels are wrapped with Continental Attack tires. Final touches include the beefy 35mm Deda 35 bars and 130mm stem, which offer enhanced stiffness compared to standard 31.8mm models, 172.5mm cranks, Tacx carbon bottles cages and bottles, Look Keo Max 2 pedals, and an SRM power meter. And of course there is the custom “gorilla” paint job, a deferential ode to the Lotto-Belisol rider who looks like he could play linebacker if he wasn’t pumping out huge watts on the roads of France. 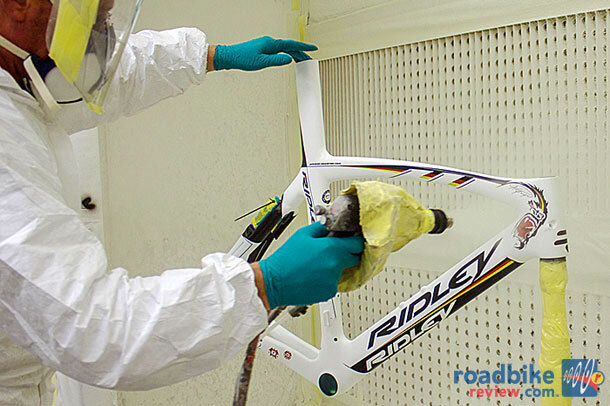 For a full tip-to-tail look at Greipel’s bike, take a look at the video below. With that bike, I could win a stage. ……… NOT!